In my search for a replacement shaft that was no long available I was referred to J. J. Hill by my friends at UST Mamiya. J.J. has been in the club fitting and club repair business for 25+ years in Southern Minnesota and the Central US. He visits courses in the area with his trailer conducting fittings and doing club repair. During a long discussion of the history of shafts, J.J. told me he had a stockpile of light weight Hogan Apex iron sets. A box arrived at my door a few days later and after sitting on the to do pile for months I decided to profile them on the redesignd EI instrument. That instrument has now moved from proto to manufacturing and will be available in a few weeks. We have repositioned the gauge, giving us more consistent and accurate readings. 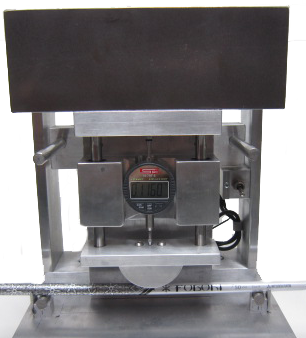 The weigh and weigh bearing surface are now machined. The shaft guides self center the shaft. The updated instrument is faster and more accurate. Most current owners are upgrading their instruments. In May, Perry Ellis International announced that the Ben Hogan brand will return to the business of club-making in 2015 via a licensing agreement with EIDOLON Brands, LLC. Terry Koehler, president and chief executive officer of EIDOLON Brands, is a lifelong Ben Hogan devotee and former director of marketing of the Ben Hogan Company. He is also the architect of the SCOR Golf wedges and set-match short irons. This re-introduction of Ben Hogan golf clubs coincides with the 60(th) anniversary of the first Ben Hogan irons in the fall of 1954. Terry Koehler has assembled a world class Research and Development team based in Fort Worth, Texas, where Ben Hogan golf clubs were first produced. The new Ben Hogan clubs will be introduced in 2015. It was that announcement that got that box of shafts from the to do pile into the shop. I am told the Lightweight Apex iron shaft was introduced by the Hogan company in 1968. The sets of shafts I tested were made for Callaway when it took over the Hogan brand. We believe these were made around 10 years ago. Much has change in steel shaft manufacturing over that time. The radial integrity of the shafts I tested was excellent, 99.8% with a 0.1% standard deviation. It does not get much better than that. Aligning these is a waste of time and effort. The numbers speak for themselves. This weight has proven to be a good fit for many golfers today. I ran the S Flex set through the certification process available from club builders equipped with the Fit2Score EI instrument. Respectable results, a slight anomaly on the 8i shaft. I have seen worse in current products. This highlights why you should have your iron shaft sets tested. The radial quality of this set is perfect, alignment will do nothing for this set. But that 8i is likely to launch a little higher than the rest of the set. My primary interest in any new set of shafts I look at is howthey compare to the shafts I know. Looking up the EI profile gives a fitter the insight of his experience with familiar shafts when he first encounters a shaft he does not ‘know’. 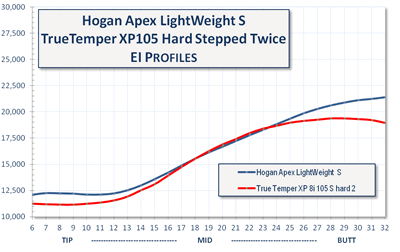 The lightweight Hogan Apex iron is a very close match to this years True Temper XP105. The XP105 is about 10 grams lighter and therefore a little softer. When I looked at hard stepping the XP105 S flex twice it came very close to the profile of the LightWeight Apex shaft. If you are interested in this shaft, J.J. Hill has them available. He can be reached at jjhillgolf@yahoo.com or by phone at 507 271 2215. He is also a good resource for UST Mamiya shafts that are no longer available. Thanks JJ for making this little piece of shaft history available. 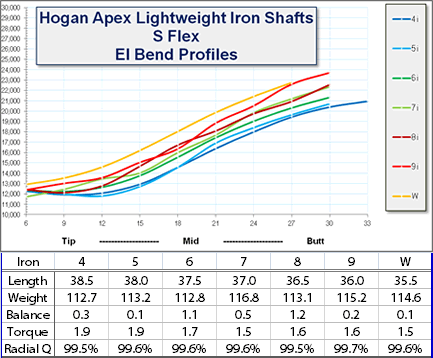 This entry was posted in Hogan Apex, Iron Shafts - Steel, Russ Ryden - Fit2Score on June 5, 2014 by Russ.